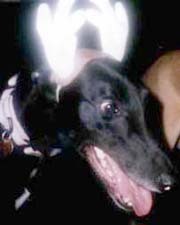 **Important Note** Some of the dogs shown were placed before the formation of Greyhound's Circle of Friends, with the help of other groups. Thank you to all the groups who have helped us over the years. Lucky - aka Bentley(black in 4th photo) & Beemer. 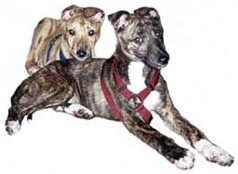 Sneaker (the greyhound) and Ruby (the whippet) were adopted by Carrie Ann & Jamie in Sarnia. 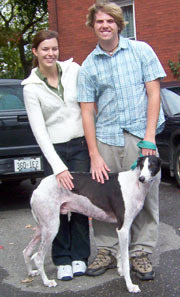 Bill and Jayne from Hamilton adopted their first greyhound, Ricky, from our group. 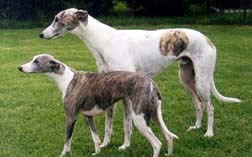 They were looking for a second greyhound to join their family once Ricky settled in, so through our recommendation they adopted Trigger (the black one) from Greyhound Adoption of Burlington, New Hampshire. 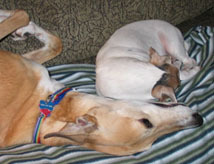 Then they fostered and ended up adopting the twins, Cruiser (aka Augie) and Blaze at two separate times through Greyhound's Circle of Friends. 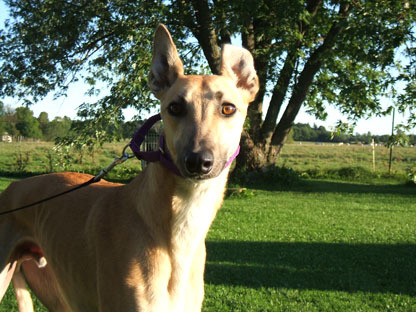 Klear was adopted by Kim & Bruce in Caledonia. 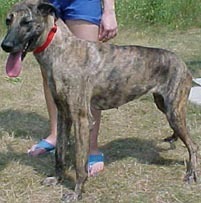 Hunter was adopted by David in Hamilton. 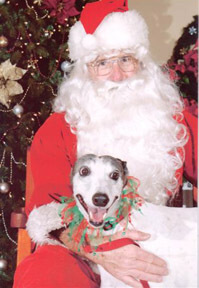 Ho-Ho-Ho, doesn't he look handsome? 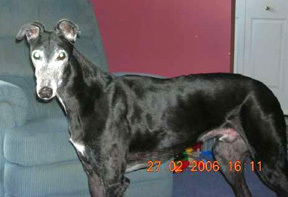 Midnight Johnny was adopted by Gail & Ron in Hamilton. He has since passed on and Gail & Ron now have Razzle. 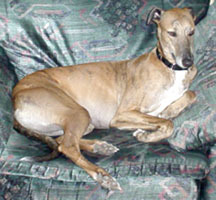 Tyville was adopted by Marie & Tony, who later adopted greyhounds Toby & Tucker. Meicah was adopted by Amanda & Chris in Ottawa, through a Montreal group. 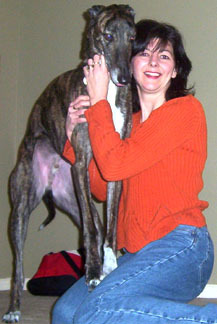 Zack was adopted by Leslie, John and Family in Burlington, Ontario (shown here with Leslie). 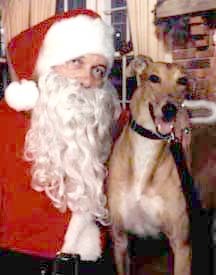 Trace & Daisy were adopted by Mark, Vicky & kids in Ancaster. Cindy was adopted by Theresa & Andy in Georgetown. 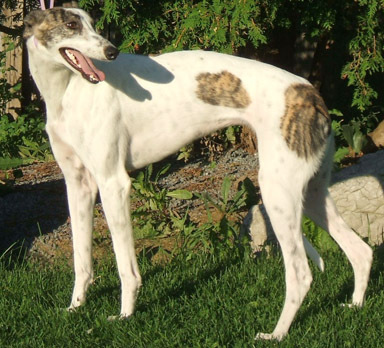 Unwind was adopted by Wendy, Dave & family in Ancaster, who have another greyhound, Palm. Amy and Dean were adopted by Anita & Orist (and their 10 cats!) in Waterdown. 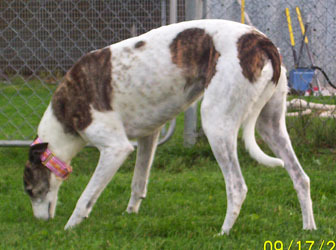 Maid was adopted by Catherine, Klaas and kids in Hamilton. 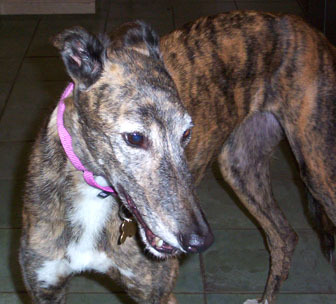 Misty (a greyhound mix) was adopted by Rick, Judy & their six cats in Pickering. 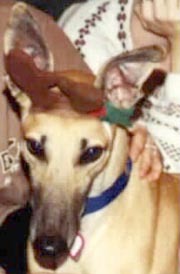 Bullet (now known as Billie) was adopted by Maureen in Toronto. 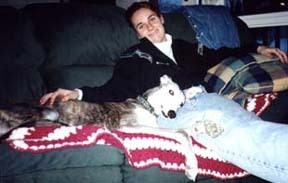 WindShear was adopted by Kathy who also has Squish (Pekingese), Diva (Whippet/Borzoi), and Remy (Picardy Shepherd). 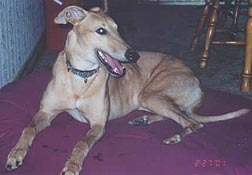 Wizzard was adopted by Carre and Jay who also have greyhound Kayla. 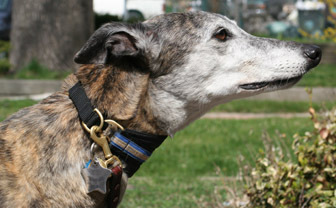 Acey was adopted by Dianne, Duane & Elizabeth who also have greyhound Kenya. 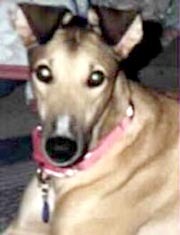 Buzz was adopted by Karen & Brad. 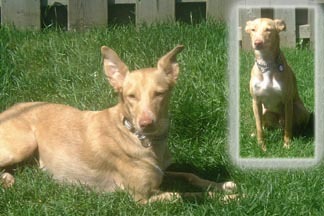 Lucy (an Ibizan Hound) was adopted by Jim and Cindy in Hamilton. 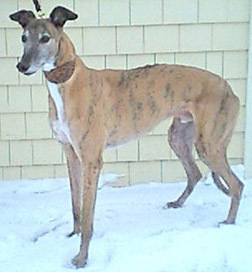 Caesar was adopted by Jeff and Jaye in Acton. 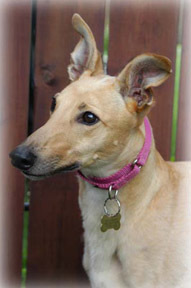 Zara was adopted by Pat & Doug in Burlington. 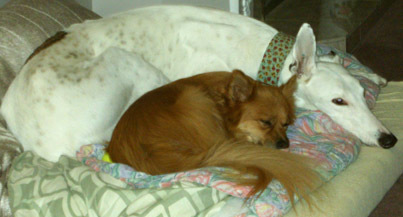 who also adopted Shatzie (the pomeranian mix) in 2006 & Cooper (white greyhound) in Nov 2008. 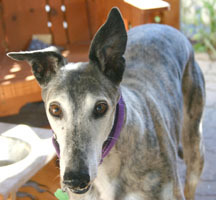 Brandy was adopted by Allan, Winnie & family in Georgetown. Bella was adopted by Beth, John & family in Cambridge, who also have a Newfoundland named Percy. 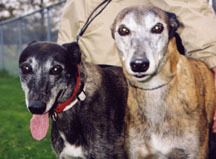 Jenna & Lady have been adopted by a family in Milgrove. Max was adopted by Kevin in Guelph. and he reciprocates with lots of love, and therapy assistance as required. 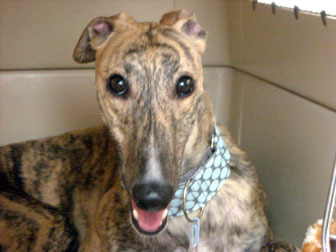 CJ (aka Crystal Jennings) was adopted by Stewart & Robin in Hamilton. Our group referred to them to another group because we didn't have any dogs available at the time. 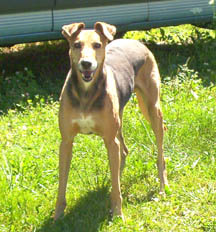 Ginger was adopted by Laura, Cam and their 2 children in Kingston. 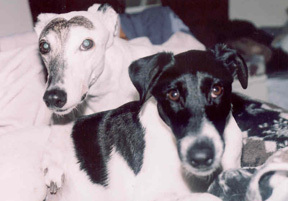 Ginger is shown here with their Jack Russell named Riley. 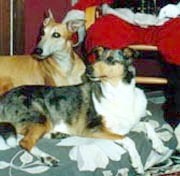 Tora Bora was adopted by Kitson and Jane in Guelph. 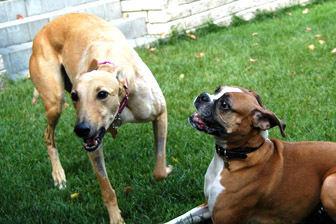 Flash (whippet on left) and Ramses (pharoah hound on right) were adopted (at two separate times) by the Hembruff family. Guy's Jack (who is 14 years young!) was adopted by the Spencer family. 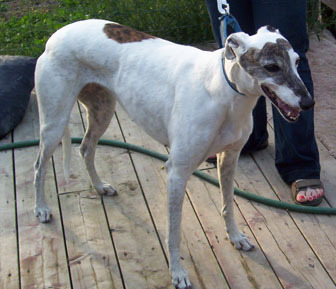 Java is now living with Larry & Debra and dalmation friend Willow, in Waterdown. Frosty Rose has been adopted by the Wilsons in Hamilton, who also have Flying Damar. The two girls are very close friends now. Damar is very outgoing and Frosty (now called Jenny) is on the subdued side. 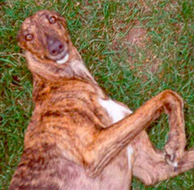 Dana (track name Bl's Texas Jen) has been adopted by a family in Woodburn. 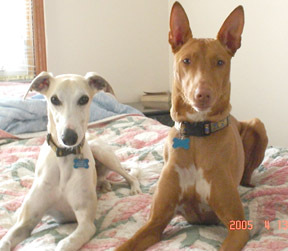 She has two big hunks looking out for her, Phyn a beautiful English pointer from BC, and a handsome red doberman named Remy. Mustang Mindy has been adopted by Terry and Ruth in Guelph. She is now a very big sister (or nanny) to a smooth-coated fox terrier named Rudy. 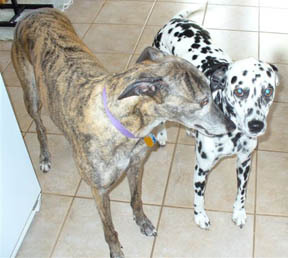 Jakara (white dog with black spots) and Raelyn have been adopted by the Nelsons. Corky has been adopted by Cameron in Toronto. 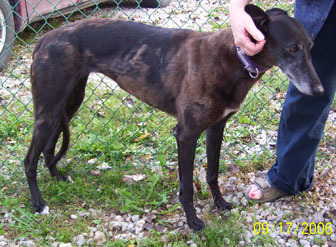 Chili Water has been adopted by Jeannette and Gregg in Brantford. Ozzy has been adopted by Shauna & Bruce in Mississauga. 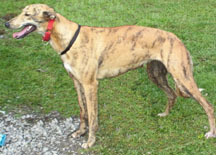 Charlie Boy has been adopted by the Wolvens near Abbingdon. 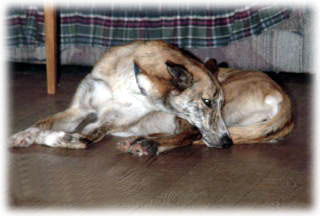 Cairo was adopted in Nov. 2008 by the Gugan family in Guelph. 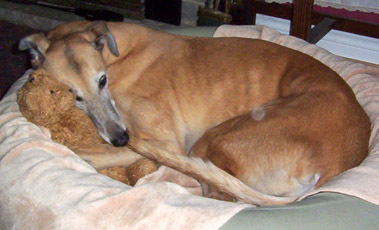 Sam was adopted in Dec. 2008 by Barb in Kingston. 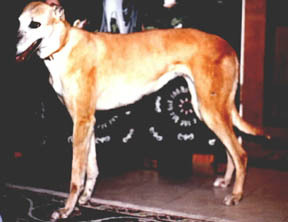 Summer was adopted in August 2008 by P. Calver. Hope has been adopted by S. Cox. Rory was adopted in Nov. 2003 by Julie & family. 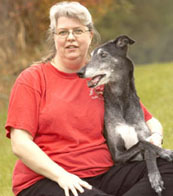 Maggie was adopted in May 2007 and Lucy (not pictured) was adopted Feb 2008 by the Wolven family with their two whippets. Jenny was adopted in March 2008 by the Renwick family. Rambler was adopted in Feb 2008 by the Muslake family. Fugi was adopted in Feb 2008 by the Reynolds family. 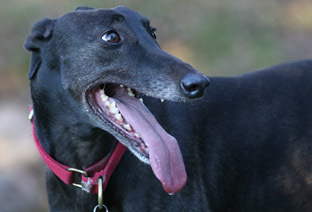 Pepper was adopted in March 2008 by the McLaren family. Casper was adopted in April 2008 by the Shaw family. 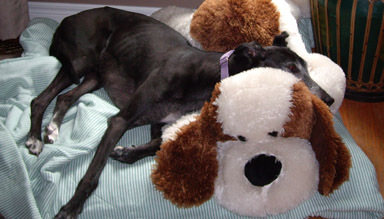 Duchess was adopted in April 2008 by Kathryn & family. Buddy was adopted in Nov 2008 by G. Fisher. 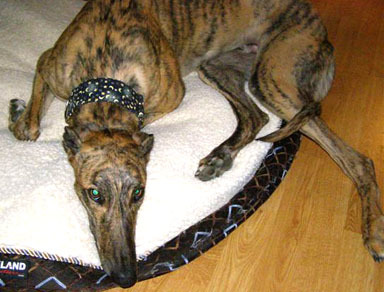 If you adopted a dog through Greyhound's Circle of Friends, we want your photos on this page! Send them to Joanne!